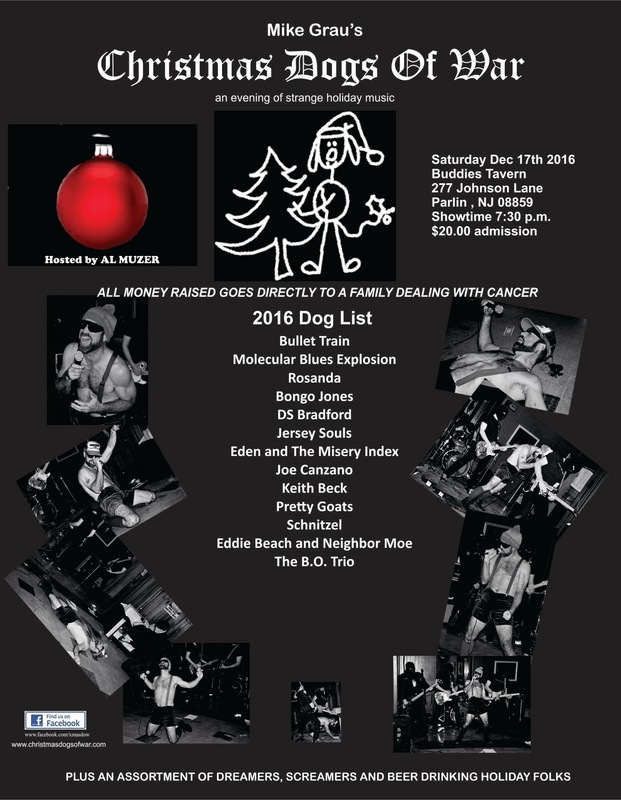 Mike Grau’s Annual Christmas Dogs of War, an evening of strange holiday music, is set to take place on December 17, 2016 at Buddies Tavern, 277 Johnson Lane, Parlin, NJ, 08859. The show starts at 7:30pm and admission is only $20. All proceeds from the event benefit a local cancer victim. The show will once again be hosted by the inimitable Al Muzer. Grau has been dishing up this zany holiday tradition for over two decades and its popularity has grown. The format includes nearly 20 local bands who each get their 15 minutes of fame onstage at Buddies Tavern. Holiday magic ensues. Everyone involved with the event does it because its a great cause: every dollar raised is handed over to a person in the local community who is fighting cancer. This year’s recipient is a 34 year old mother of four, Jacqueline Cuddey. If you can’t make the event, you can still contribute in a variety of ways. Grau, also a wildly gifted artist, is selling T-Shirts that feature his original designs and humorous memes, all priced at just $25. He’s also selling framed prints of his original works, signed by the artist, priced at just $40. And of course, you can just click the “Donate” button that’s sprinkled throughout the site and give what you can. This beautiful donated guitar and drum kit will be raffled at the show!